Instead using ceramic or gas or any traditional methods, electromagnetic energy is used to prepare food in portable induction cooktops. They have copper wire which allows the flow of electricity along the cooktop. The cooking vessel allows for proper passage of heat as it is a good conductor. Once induction cooktop detects the pan, current generates heat on the magnetic field. 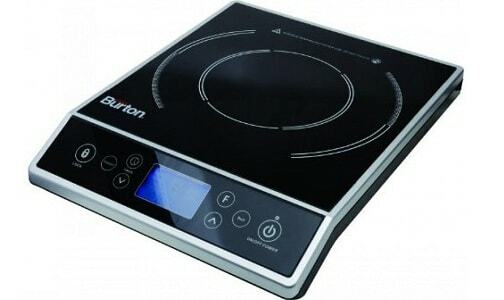 Induction cooktops are used to solve all the issues in traditional cooking. There is no risk of real flame and improper heating in traditional stoves. You can also use induction cooktops as side burners to accommodate large family and more number of guests. They are economical, fast, and affordable. They save up to 70% of electricity as compared to traditional electric stove top. Cooling Fan – Be sure to have cooling fan in induction cooktop. It is used to cool down the engine. It is important to ensure efficiency of engine by keeping the temperature under control. 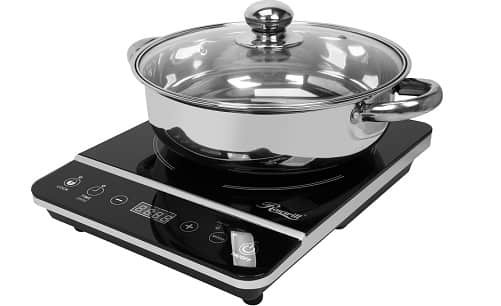 Portability – Consider your needs before buying induction cooktop. Choose the portable cooktop because it adds to the flexibility. You can carry it wherever you go. You may want to carry it to picnics or office. Ceramic Cooktop – Ceramic cooktop is not common in cooktops. It is a non-conductive material which means it doesn’t conduct electricity or heat. So, it adds the safety so you can touch cooktop and use it without getting zapped of current. You can also avoid its heat while working. 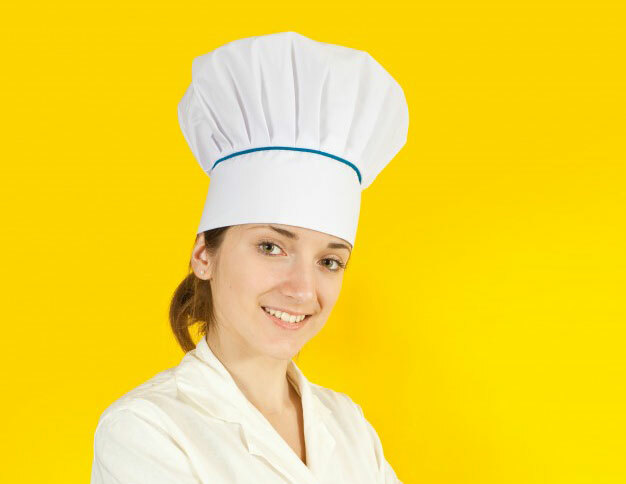 Cooking Modes – Temperature requirement varies according to the type of food. This is the reason induction cooktop comes with various cooking modes. Temperature needs also vary by cooking methods. Be sure to choose the suitable mode for your needs. 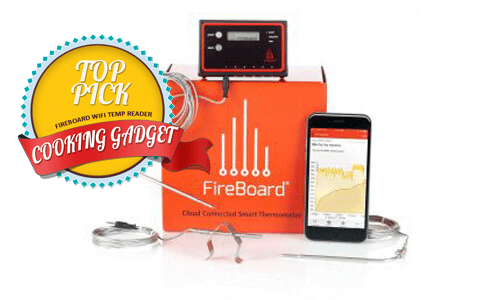 Overheat Detection – At some point, induction cooktop is a machine which gets hot. So, it is not suitable to use it in that case. 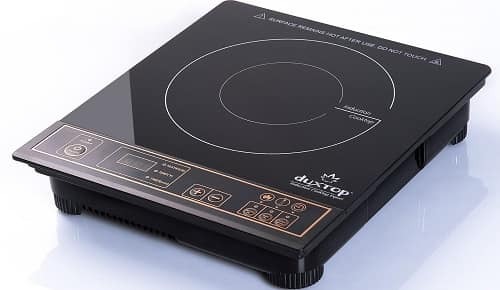 Overheat detection is the best feature to look for in induction cooktop. It turns off the power supply once it detects overheating. It has heat sensor which does it automatically. Pan Detection Sensor – The advanced induction cooktops have pan detection sensor which automatically detects the pan to start working. When you remove the pan, it will turn off. This feature is quite useful to save energy. Auto Shutdown Timer – At times we are in a hurry and frequently forget turning off the cooktop when not in use. It wastes a lot of energy. So, some cooktops come with auto shut down timer. If cooktop is remained idle for several hours, it automatically shuts down. You can also set up the timer manually. So, make sure the cooktop comes with this feature. Power Efficiency – Most cooktops come with up to 40% to 90% of energy saving rate. Before buying portable electric cooktop, be sure to check its energy efficiency. Portable induction cooktops have been designed to dramatically change your cooking methods. Induction cooktop look almost the same at first sight as electrical counterparts. But the electromagnetic field is the main difference. It makes pan to generate the heat in itself for cooking food. Induction technology is considered to be the fast, safe and most precise way of cooking like a pro. Smart – In this day and age, every device you buy runs on electricity. Using electricity is the smart and more efficient way to power up a machine. It can be used anywhere and anytime. Eco-Friendly – Induction cooktops are literally an eco-friendly way of cooking as it runs on electricity. You no longer need to burn coal or wood. You also don’t have to cut trees which produces smoke and toxic fumes. On the other side, you can avoid this type of threat with induction cooktops. Fast – Modern induction cooktops are fast and deliver quick results. Accuracy – You need to set the right temperature and it will do the rest. Portable – They are compact, easy to store and carry. They are supposed to be the best choice for cooking outside and for small places. This portable induction cooktop from DUXTOP consumes 15amps of power with 120volts of capacity. 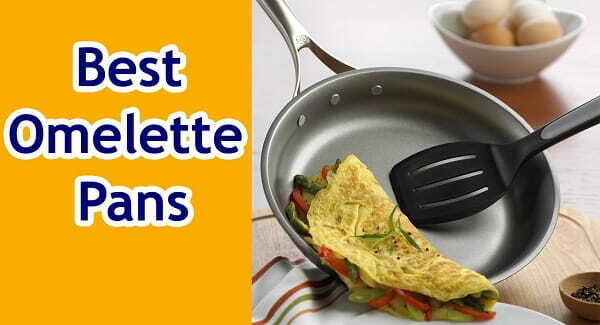 It is compatible to different types of premium cookwares. It supports all the enamel, steel, cast iron, and stainless steel materials. It improves stability with magnetic bottom once it is placed on the counter. All in all, it is the best induction cooktop thanks to compact design. It is easy to store and comes with digital control panel and inbuilt counter. You can set the timer up to 170 minutes. The 10-temperature feature changes temperature ranging from 140F to 460F. It has 1800W of motor. It also turns off automatically when it detects no appliance or cookware for a long time. This way, it avoids overheating and short-circuits. It also displays warning messages about low and high voltage. Instead generating heat and transferring it to the vessel, induction technology makes your cookware the heat generator itself using its electromagnetic field. Hence this method is absolutely different than others. Secura Gold 9100MC has 15 power levels from 200W to 1800W so you can meet all your cooking needs, i.e. from searing fish or meats to simmering sauce or soup. 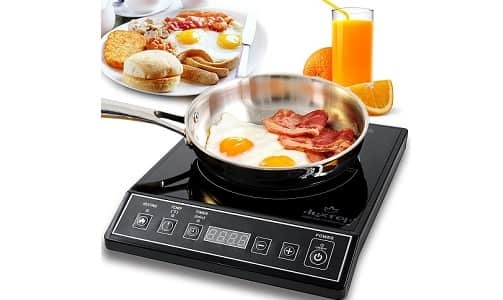 This induction cooktop is very portable and a high selling and dependable unit with a lot of options for cooking. You can easily adjust temperature from 140F to 460F and you can easily operate it with digital control. Its burner is lightweight and compact so you can easily transport and store it. Stove has in-built digital countdown timer ranging up to 170 minutes. It also comes with integrated safety features, such as diagnostic error message, automatic pan detection, and high and low voltage alarm. 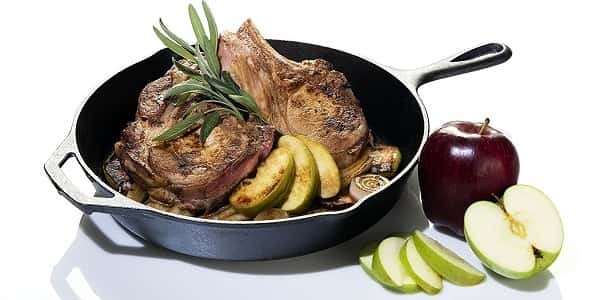 It supports all the induction-ready pans and cookware, such as cast aluminum steel and iron, stainless steel with magnetic bottom, and cast iron. Secura manufactures induction units as per North American electrical standards. 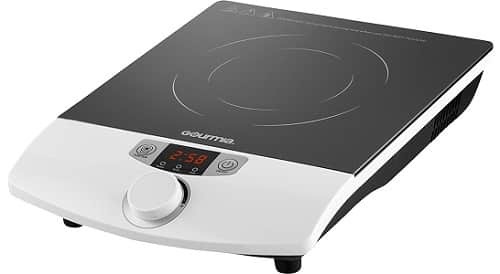 Gourmita GIC-100 is a multifunctional and portable 1800W induction cooktop that has a lot of amazing features like Timer, SmartSense Auto Detection, Temperature control and 8 power controls. Now you can enjoy more precise cooking from 200W to 1800W power levels and from 180F to 460F temperature settings so you can boil, deep fry, simmer, stir fry, slow cook, sear and steam, grill and melt, and even more with digital display and temperature knob dial. It doesn’t need open flame or coils to avoid risk of burns. You can easily perform high heat cooking for searing meats and crispy fries with less butter or oil required. It also includes child safety locks. You can set cook time with its 180-min timer and auto turn-off. Rosewell RHAI-13001 is a 1800W induction cooktop now comes with a great deal at a very affordable price. It comes with a stainless steel pot that has removable lid. Most of the portable induction cooktops don’t come with induction ready cookware. It is the best deal for those who are looking for induction cooktop but don’t have any induction ready pan at home. It is the best deal to experience modern cooking at the comfort of your home. Along with it, Rosewell RHAI-13001 has 1800W capacity split into 8 different power levels starting from 300W, and 8 temperature settings up to 450F from 150F. It has elegant black and sleek polished crystal cooking surface which maintains great shape and easy to clean. It has large LED display placed at the center so you can keep tab on your setting. You can set the timer up to 3 hours. This cooktop is also versatile for deep frying, braising, fry, boil water, stir fry, and roast. You can also save money and time. Max Burton 6400 is one of the best-selling portable induction cooktops on Amazon. It has square cooking zone, digital touch controls, control panel, and 1800W of power. The control panel is placed on bottom so you can read the display and change settings anytime with ease. It has 10 temperature levels you can set from 100F to 450F. It has two buttons for simmer and boil on the control panel. It also has lock button to lock the menu to avoid changing settings by accident. It has timer for up to 180 minutes and heating element is marked with white curves under the cooking gas surface. It can be used both outdoors and indoors with right power supply. 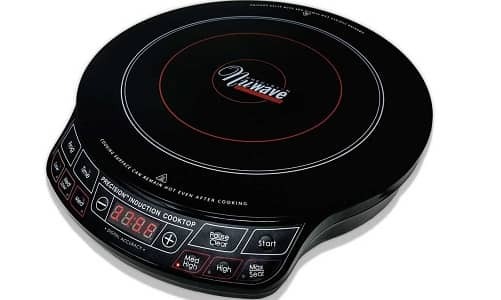 NuWave Precision Induction Cooktop is your best friend in your kitchen as it has adjustable temperature control in 10-degree enhancements. With 100F of minimum temperature setting and 575F of upper limit, the cooktop has wide range of temperature setting as compared to rival models. It allows appliance to serve as more than a cooktop. NuWave PIC is a smart cooktop as it provides great programming with 100 hours of memory to prepare any recipes easily. It has delay timer to start cooking whenever you need. 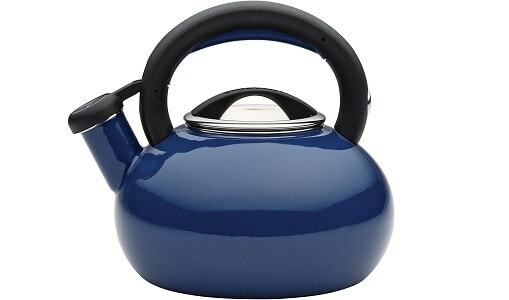 It is engineered with circular design with ample space which has no cooking function. Chef’s Star 1800W Portable Induction Cooktop can easily get you along the cooking process, without using hazardous microwave. It doesn’t create heat which is moved to the vessel. Instead, the electromagnetic field makes vessel the generator of cooking heat. This way, it is totally different from other cooking technology. It comes with a lot of safety features, such as diagnostic error message and pan detection system. Always use right type of induction-ready cookware. Induction is a noise-free process. But it may cause high pitch sound from clad cookware as it has multiple layers of metals on the base. 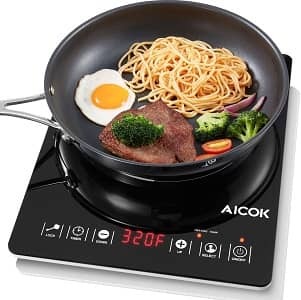 Aicok Portable Induction Cooktop is fastest and safest induction technology and very precise to cook food at specific temperatures. With touch control feature of the sensor, you can easily control your settings with one touch. It has inbuilt countdown timer. It has 15 temperatures from 140F to 460F, 15 power settings ranging from 650W to 1500W. So, you can easily create whatever you want in minutes. The countertop burner has child safety lock, automatic shutdown timer, overheat protection, and pan detection. It is compact and lightweight for easy storage and handling. It is also very simple to clean with paper towel or wet cloth in dish washing liquid. It can easily support stainless steel utensils with magnetic bottom, cast iron, and cast aluminum enameled steel and iron. 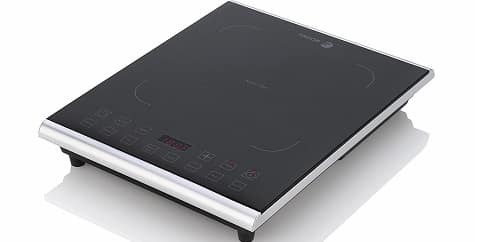 Fagor Portable 1800W induction Pro Magnetic cooktop is powerful, versatile and user-friendly. One thing which keeps it apart is its 8 quick launch buttons which takes guesswork out. It has 8 predefined temperature settings, such as simmer, warm, Saute, rapid boil, sear, brown and stir-fry to ensure precise temperature control to meet all your specific needs of cooking. The temperature setting is starting from 140F to 465F. It is easy to clean and durable with heat-resistant glass. It can easily work on around 1800W of power. It has in-built timer of around 180 minutes. It shows cooking temperature in digital display that you can raise and lower by increments of 10 degrees. 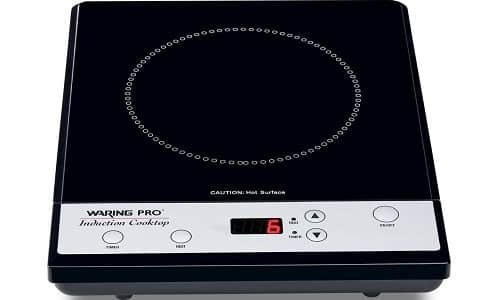 The Waring Pro ICT200 induction cooktop saves up to 70% of energy as compared to traditional burners. It is very easy to use and efficient as it provides quick heating and cooking. It is also backed with 5 years of warranty on motor and 1 year on full product. 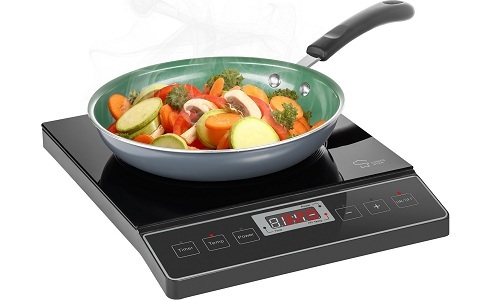 It is exhaust-free, safe and flame-free induction cooktop which provides even and fast heating. When you lift off the pan and forget turning it off, don’t worry. It will turn off the heat automatically after 30 seconds. Listed above are some of the best selling and top rated portable induction cooktops for 2018. We have handpicked the above models for their heating performance, accuracy, efficiency, durability, energy-efficiency, safety, design and other important aspects for your cooking. All of the induction cooktops recommended here are innovative and user friendly. You may find some models costly but they are worth every penny for healthy eating. If you are going to use these cooktops, we bet your cooking has never been so different. We hope this guide will help you choose the best portable induction cooktop according to your budget and needs. Happy Shopping!